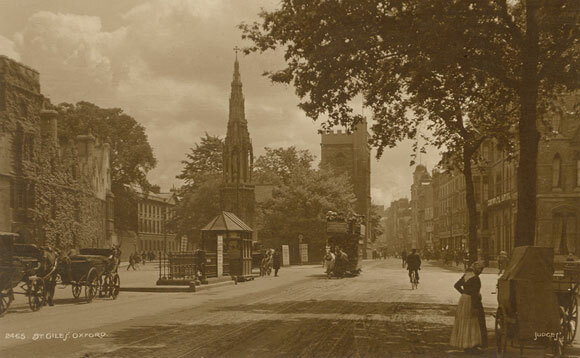 This postcard shows the south end of St Giles in about 1910, with a horse-tram just approaching the cabmen’s shleter. On the left are horse-cabs waiting for customers; and on the right is a woman about to uncover a barrel organ. William Morris (later Lord Nuffield) brought a dozen motor buses from London overnight in November 1913 and the Oxford Motor Omnibus Company was formed.